Built-in transducer with adjustable vibration levels. One pre-settable limit value with built-in heavy-duty relay and two selectable response delay times. Designed to meet ISO 2372 requirements. The VIBROCONTROL 920 is a single channel vibration monitor that accepts virtually any pickup including velocity sensors and 2, 3, or 4 wire accelerometers. A user-friendly microprocessor program gives operators the security of password protection while allowing them to pre-program limits for warning devices in the event components deteriorate. Higher limits can also be set which will automatically shut the equipment down before a catastrophic failure occurs. A third “okay” relay continuously monitors pickup, cable and circuit connections to ensure proper system performance and protect against faulty signals. The VC920 features a 4-20 mA output for system integration with a PLC, and a buffered output for instant vibration analysis. Present vibration measurements can always be visually inspected using the convenient LED indicator on the face of the instrument. The VC920 accepts all power supplies and is easily mounted on rails or within a cabinet enclosure. For use when monitoring the rapid movements of the bearing caps and bearing housings. Either electro-dynamic or piezo-electric vibration sensors mounted in the horizontal and/or vertical and/or axial directions measure these movements of the machine bearings. 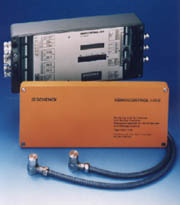 For use when monitoring the rapid movements of the rotor shaft relative to the bearing housings. These measurements are exclusively performed on journal bearings, for which each bearing is fitted with two radial mounted at 90° offset to each other non-contact eddy current sensors. For use when the journal bearing machine changes in the axial distance between the axial bearing and a thrust collar are considered. This measurement is performed using non-contact eddy current sensors. VIBROCONTROL 1100 provides maximum protection for units critical to operation with a unique two-channel capability that can monitor the vibration and bearing condition (BCU) simultaneously. Signals from either an accelerometer or absolute vibration velocity (seismic) transducer can be converted into a variety of measurement parameters such as acceleration, velocity, displacement or BCU. (Note: an accelerometer is required to measure vibration acceleration and Bearing Condition Units). For each channel a DC current or DC voltage proportional to the measured value is always available for the connection of an analog meter and/or PLC. The microprocessor controlled monitoring unit is equipped with six adjustable alarm limits which can be pre-programmed and configured with audible,visual and circuit alarms in the eventcomponents deteriorate. Systems can even be programmed to shut the equipment down and avoid catastrophic failure. The VC1100 has a rugged – NEMA4 – heavy aluminum case that can be permanently mounted in nearly any industrial area. Units can be set up manually, via the 5 button keypad, or automatically with the optional setup software package via a PC. Up to 205 units can be daisy chained together and then linked to a PC or process controller for a complete machinery protection program. The software package allows bar graph viewing of measured parameters, in addition to alarm and relay status. The design of the Vibrocontrol 1100 provides affordable, state of the art, 24 hour protection from excessive vibration for either a single machine critical to your process, or for your entire plant.